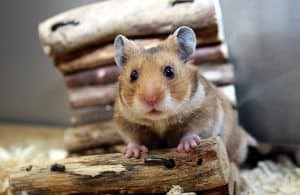 Providing your hamster with a consistent source of freshwater is a vital part of being a hamster owner. Your favorite furry friend can suffer from dehydration without it, which can cause all sorts of issues. But finding a hamster water bottle with these qualities can be quite tricky. I mean, there are a lot of options out there, and many of them will have significant problems. You’d be surprised by how many so-called high-quality water bottles have leaking issues. As a result, I thought an article highlighting the top hamster water bottles on the market could be useful. And after some significant research, I’ve found that the following nine water bottles should more than meet your needs. So please, read on and let me point you toward some water bottles that you’ll love! I promise anyone of these will more than meet your expectations. If you’re looking for a water bottle with a large water capacity, this one could be an incredible option. It has a 10 oz capacity, which is more than enough to keep your hamster hydrated during the day. It also has a ball stopper that ensures there are no leaking issues: it’ll only release water when you little furball is drinking from it. Plus, it has a .3 inch nozzle, which is small enough for your hamster to drink from it comfortably. But the best part about this water bottle is how easy it’s to install. All you need to do is attach the screw-on bracket onto your hamster’s cage, and you’re all set. It’s always a nice touch when there’s nothing too complicated about a product’s installation process. Another added benefit is this bottle’s made entirely from high-quality materials that are lead-free: stainless steel for the drinking head and BPA-free plastic for the container itself. Click here to check this water bottle out on Amazon! The Dahey Drinking Water Bottle For Small Pets is one of the more unique products in this article. 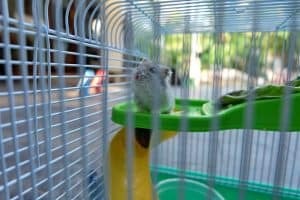 It has an almost igloo shaped design which won’t be such an unattractive addition to your hamster environment. But it doesn’t just look cool; it’s made from pet-safe ceramic, which is entirely safe for your hamster to use. This material is also incredibly durable and makes a lot less noise when it’s being used than the plastic models. Its 8 oz capacity is another useful feature as it’ll make sure your hamster has enough water for the entire day. 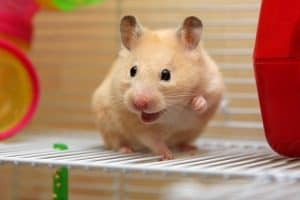 You could take a short trip out into the world and not have to worry about your hamster having enough water. Since it’s leak-proof, you won’t have to worry about the cage floor become all wet either. If you end up buying this product, there’s not an area where it’ll fail to meet your expectations. Click here to check out this water bottle on Amazon! With its patented No Drip technology, you can bet this water bottle is completely leak-proof. But this guarantee isn’t the only quality feature this product offers; it also has 11.2 oz capacity, which is among the biggest on this entire list. 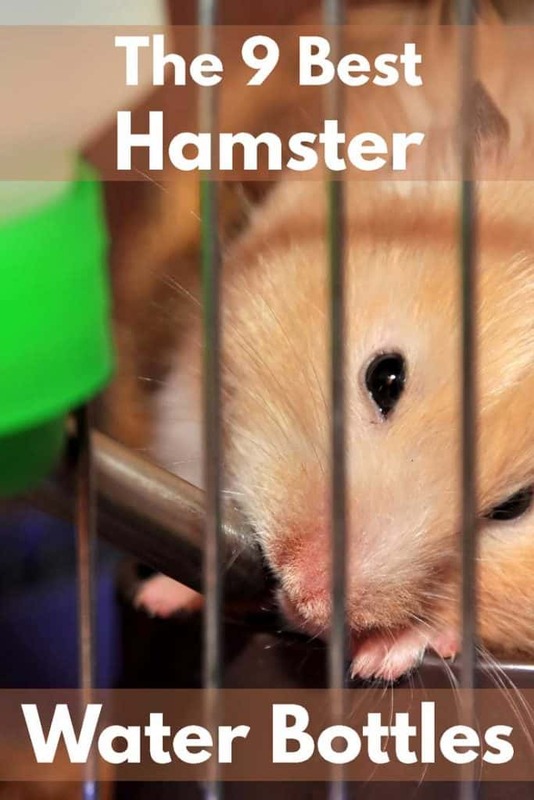 Its large capacity will help your hamster avoid all the danger that comes with dehydration. This product also enables you to feel environmentally conscious as this model is eco-friendly: you can switch the provided bottle with any other such as a soda bottle. Its easy installation process with its screw-on bracket gives you another reason to consider this fantastic bottle. It even has an affordable price, which isn’t always a given in this marketplace. The fact you can pick between three different colors is a fun added benefit as well. It never hurts when a manufacturer gives you a choice regarding a product’s style! Whether you need a water bottle for a glass tank or a cage, this next product could be a perfect fit. It’s an easy to install model for both scenarios and won’t cause you any stress cleaning either. If you’re worried about the durable of this product, you shouldn’t be as it excels in this area too. The nozzle is made from high-quality stainless steel, while the bottle itself is made from BPA-free, heavy-duty plastic. And its rounded edge design will ensure your hamster doesn’t chew through it. These rounded edges make it much harder for your hamster to climb up the water as well. You’d be surprised how much of an issue this predicament is with other models. You also have a choice regarding the water bottle’s capacity: 5 oz or 10 oz. Both of which can be purchased at a reasonable price. The Kordon Oasis 8-Ounce Bell Bottle is one of our more expensive bottles on this list. But with its fantastic features, this model’s undoubtedly worth the elevated price. A good example would be the rounded nozzle, which is creatively designed to discourage chewing. With a feature like this one, you can reasonably expect this product to remain in pristine condition for a long time. It also comes with a hold guard, which will ensure it stays secure and avoid any problematic leaking. The design itself with its elegant decor is another attractive quality this water bottle offers. I mean, you’re going to be looking at these water bottles every day: wouldn’t it be nice to have a design that wasn’t such an eyesore? Not to mention that it’s an easy install with its adjustable strap and has an 8 oz capacity as well. All of these features put together make one very high-quality water bottle. This water bottle is a versatile option that can be a cozy sleeping stop for your hamster as well. As a result, you don’t have to mount this bottle on the side of the cage. You can instead place this model inside your hamster’s home and let it get to work. If you’re worried about it tipping over, this water bottle has a stable base that’s made from plastic and metal. The base is also compatible with other hamster bottles, which further shows the versatility of this product. As for the bottle itself, it can easily be slid in and out for cleaning purposes. The cleaning process is remarkably simple with the bottle being anti-odor and anti-dust. It’s also has a nozzle that was designed with a premium rolling ball to prevent leaking issues. It even has four different colors you can choose from that’ll spice up your hamster’s cage. With its heavy-duty glass bottle, this model will make sure it won’t fall victim to your hamster’s relentless chompers. It also has a stainless steel cap and nozzle for extra protection, which makes this product virtually indestructible. In fact, it can even survive a round in the dishwasher proving that this model’s incredibly practical and easy to clean. Its practicality continues to shine through when you notice the product’s rubber stopper and double ball valve. These two features provide this product with leak-proof capabilities and consistent performance: two handy qualities for your water bottle to have given the issues soggy hamster bedding can cause. It also helps that you have a choice of where you want to mount it with its springs and clips: outside or inside the cage. This feature again speaks to the practicality that this product would offer the lucky person who bought it. Click here to check out this water bottle on Chewy! The Delight Eshop Pet Water Drinking Bottle is a product you won’t regret considering. It has everything a hamster owner could want a water bottle to have regarding features. I mean, its nozzle’s second to none. This nozzle has a stainless steel ball at the end of it that’ll keep the water bottle from leaking. It does by making sure it only opens when your hamster’s drinking from the bottle. It’ll stay in a locked position at all other times. Aside from its high-quality nozzle, this product also has 12 oz water capacity that’s the largest on this list: another area where this model outpaces its competitors. It’s rather apparent this manufacturer did a fantastic job creating an affordable, top-notch hamster water bottle. If you weren’t convinced enough, this bottle’s an easy install thanks to the inclusion of the spring rope as well. If you’re looking for a long-lasting water bottle, the Newweic Pet Drinking Bottle could be an option worth considering. Its nozzle’s high-quality, stainless steel construction make it an incredibly durable product. The base being made from high-grade plastic further proves this product’s extraordinary durability. This aspect isn’t the only one where this model excels, however; it also resistant to odors and has an easy cleaning process. But none of these aspects is the best feature as that goes to the food compartment designed into the base. This product becomes a one-stop shop for your hamster with this feature. No longer will need a separate water bottle and food bowl in your hamster’s cage. Given these features, you can tell this water bottle is capable of providing top-notch performance for years to come. You then factor in the reasonable price, and you got a product that should move up your list. After reading all about these fantastic hamster water bottles, which one do you think is the best? Please let us know in the comments down below. Your feedback is always appreciated!